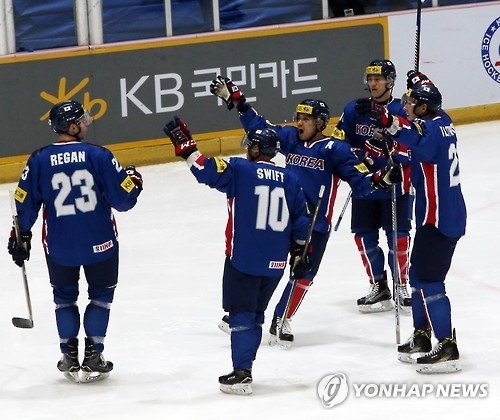 SAPPORO, Japan, Feb. 14 (Yonhap) -- South Korea on Tuesday finalized its men's hockey roster for the upcoming Asian Winter Games. Coached by former NHL defenseman Jim Paek, South Korea will go for its first-ever Winter Asiad gold medal starting Sunday in Sapporo, Japan. The host nation and Kazakhstan are also considered strong medal contenders. South Korea's No. 1 goalie Matt Dalton made the 23-man team. His status for the competition had been murky because of a rule governing naturalized athletes at Olympic Council of Asia (OCA) competitions. Dalton is one of several foreign-born hockey players who've been fast-tracked to South Korean citizenship ahead of the 2018 PyeongChang Winter Olympics. Dalton got his Korean passport last March. Athletes must have lived in their adopted country for three years before they can represent that nation in OCA events. But the Korea Ice Hockey Association (KIHA) has asked the OCA if Dalton can still be eligible because he's been playing in Korea since 2014. And Dalton, along with defenseman Eric Regan, who also became Korean citizen in March 2016, both got the green light for the Sapporo Games. As the top goalie and the No. 1 defenseman who anchors the team's power play, Dalton and Regan are expected to be crucial pieces for South Korea. Of other naturalized athletes, only the injured forward Brock Radunske will miss the Asian Games. Forwards Michael Swift and Mike Testwuide will lead the attack. At the Euro Ice Hockey Challenge tournament on home ice last week, South Korea shut out Japan 3-0, only its second win over the regional rival in 22 meetings. South Korea will open the Asian Games gold medal pursuit against Kazakhstan on Feb. 22. South Korea has never defeated Kazakhstan, the 2011 Asian Games champion, in 11 tries. South Korea will then face Japan on Feb. 24, and then China on Feb. 26. Medal winners will be determined after the round robin play among these four nations.